Located at 120 King Street, in the heart of the Exchange District, our building was constructed in 1896 and was the home of Andrew Carruthers, fur merchant. Over the years, the building was home to Der Nordwestern Publishing Company and the offices of Canadian Pacific Airlines. Sparling Sales successfully operated their business at this location from 1951 through 1983. It was in 1983 that this location first operated as a restaurant and for brief periods of time, both Momma Lou’s Steakhouse and Stage Deli operated here. It was in August of 1987 that the Kings Head Pub first opened its doors to Winnipeg as the first pub in the city, and introduced Winnipeg to the import beer market. King’s Head first started off as a 40 seat pub with only 6 beer taps on tap and over the years expanded to its current capacity of 400 seats plus an outdoor patio. We now have one of the largest tap selections in Winnipeg. 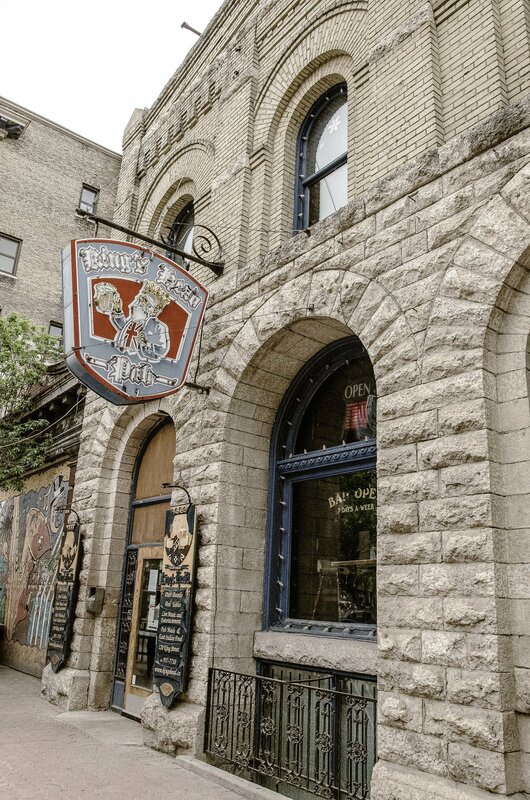 King’s Head Pub is one of the longest established businesses still in operation in the Exchange District and we are proud to say that since the time of inception we have remained true to our values of being an independent and family run business.